Jos. A. Bank called the Men's Wearhouse bid "inadequate and opportunistic." Men's Wearhouse submitted an offer last week to buy rival Jos. A. Bank. Jos. A. Bank's message to shareholders Friday? You're not going to like the way it looks. Men's Wearhouse's $1.6 billion hostile bid offered Jos. A. Bank (JOSB) stockholders $57.50 a share, a modest premium from Friday's closing price of $56.49. "The Offer significantly undervalues Jos. A. Bank, and its future prospects," Jos. A. Bank (JOSB) said Friday. "Men's Wearhouse's true motives are unclear and its commitment to the Offer is not credible." The firm added that it "is continuing to consider strategic alternatives, including acquisitions, which will maximize stockholder value." The announcement marks the latest development in the months-long takeover battle between the two menswear merchants. Jos. A. 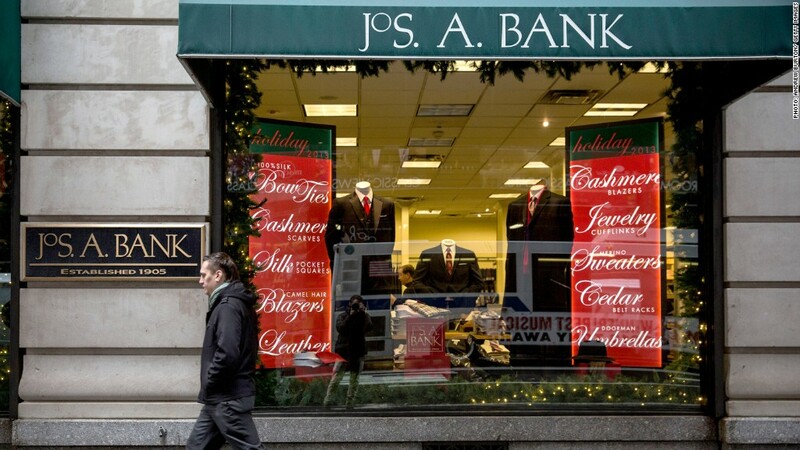 Bank made an offer to buy Men's Wearhouse last year for $2.4 billion. Men's Wearhouse rejected that bid and countered with an unsolicited bid of $55 a share for Jos. A. Bank -- a proposal that was also rejected. "Given that the Jos. A. Bank Board has publicly acknowledged the compelling strategic logic of this transaction, we think Jos. A. Bank shareholders should question why their Board is refusing to negotiate with us to reach an agreement that will deliver to them significant value," Men's Wearhouse said Friday. Earlier this month, Jos. A. Bank announced a shareholders' rights plan, commonly known as a poison pill defense, to block hostile bids by granting additional shares should any buyer acquire 10% of its shares. It's been a tumultuous few months for Men's Wearhouse, which is under pressure from its largest shareholder, Eminence Capital, to secure a deal. Last June, the retailer announced the firing of George Zimmer, its chairman, founder and long-time pitchman.